Visit the Clark Planetarium (FREE!) to learn more! 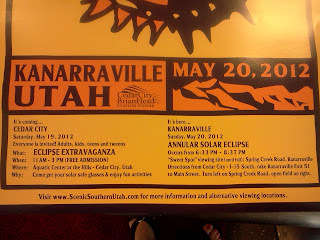 On Sunday, May 20th 2012, there will be a solar eclipse, and a small town in Southern Utah is going to be a prime viewing spot! 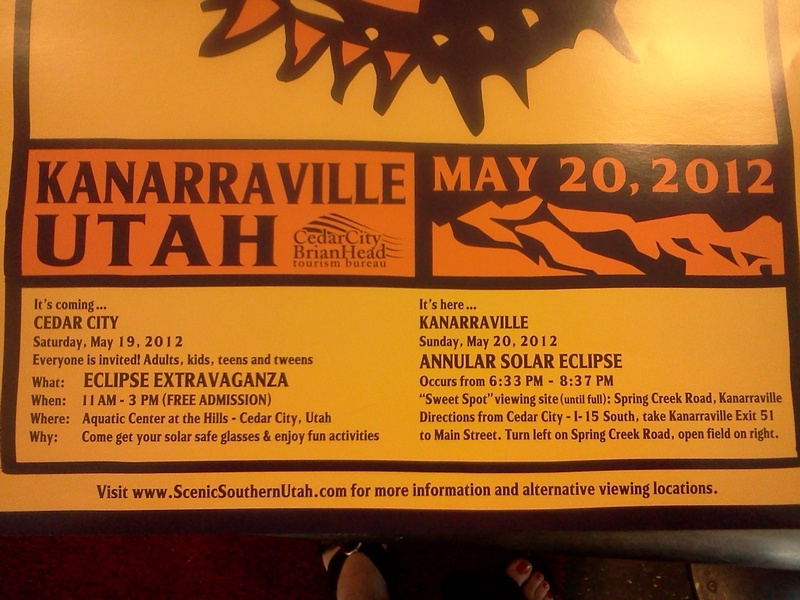 Head down to Kanarraville, UT and you will be able to see this eclipse in it's entirety. According to Robert Taylor, Vice-President of the Salt Lake Astronomical Society, the Eclipse will start in the afternoon (1ish), peaking around 5pm, and run until sunset. 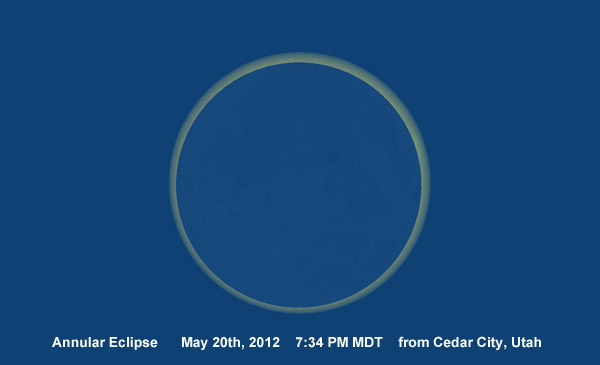 Exact times of the May 20th 2012 solar eclipse can be seen HERE. Utah is -7 hours from UTC, just subtract 7 from the posted UTC time to get the local Utah time. You can click on the red line to get the local times. You can view the eclipse anywhere along the red line. UPDATED INFO! May 14th 2012. READ HERE. There will be a large field in Kanarraville for viewing the eclipse, and because this is a rare event, make sure you get your reservations as soon as possible if you plan on staying overnight. If you are planning on going down and viewing the eclipse, email me at michelle@enjoyutah.org. We will be down there and would love to have the chance to visit with you! DISCLAIMER: I am not part of any group that is organizing these events. I am just a backyard astronomer like most of you, excited to experience this rare solar eclipse in Utah. In celebration of the solar eclipse, Bryce Canyon will be holding a four day Astronomy Festival May 17th - 20th. Read more information HERE. 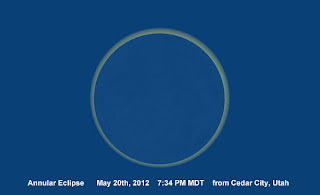 The eclipse we will experience on May 20th is known as an "annular eclipse". This means that as the moon moves in front of the sun, it won't be big enough to completely block the entire sun. As the moon creates a shadow across the sun, you will be able to see a glowing ring from the sun on the outer edges of the moon. You can read more about it on the Clark Planetarium website. What kind of special equipment or glasses will I need for viewing the eclipse? Looking straight at the sun during an eclipse can cause permanent vision loss. According to the Clark Planetarium, Your retinas don’t have pain receptors, so if you ignore this warning and look at the Sun directly, it won’t hurt while you ruin your eyesight. Ophthalmologists (medical doctors who specialize in conditions and diseases of the eye) have a word for this kind of vision loss: Solar Retinopathy, also known as “Fried Eyes Syndrome.” You can read more about it and what it is on the Clark Planetarium website. 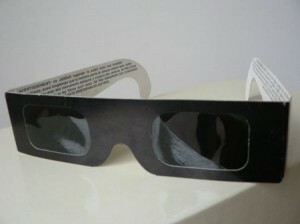 Eclipse Glasses: The Planet Fun Store at Clark Planetarium sells a variety of solar viewing filters that are designed to be worn like sunglasses or slipped over the front of your binoculars or telescope. These will not only come in handy for the May 20th Annular Eclipse, but also the June 5thTransit of Venus and the August 21, 2017 Total Eclipse of the Sun that will be visible in much of the U.S. Even better, any time there’s some significant sunspot activity (as expected next year) you can use these filters to look at sunspots. Pinhole Projector: A homemade device using a long box, a pair of scissors, a thumbtack, and a box cutter. Read instructions on how to make this simple device on the Clark Planetarium website. Even if you are going to purchase eclipse glasses, this is a fun project to do with your kids so that they can see the eclipse both ways. What kind of viewing practices are NOT okay during an eclipse? Here is the information from the Clark Planetarium on what equipment is NOT okay to use. If you have any questions you can contact the Clark Planetarium. Sunglasses, even doubled-up, even polarized. They don’t block enough light. Smoked glass. The soot coating is very difficult to get to just the right thickness, and it rubs off way too easily. Exposed Black & White film. 1) Who on Earth still has film these days? and 2) The odds are hugely against you having the right kind of film and properly exposing and then developing it to make it useful as a solar filter. Welders Goggles. Unless they’re Grade 14 or stronger and specifically made for arc welding, they don’t provide adequate protection. After the eclipse, make a vacation out of it and stay the night. Kanarraville is 4 hours from Salt Lake City, so if you had to drive home afterward, it is doable, but much more comfortable to stay overnight. I recommend booking your stay as soon as possible, as many of these places are filling up! If you know of other campgrounds and great spots to stay, please email us at contact@enjoyutah.org so we can add it to the list! Via Netflix, Watch The Wonder Years, Season 6, Episode 17, when they travel to the planetarium to experience a solar eclipse. Watch an animated demonstration of a solar eclipse.